Here at Sumo Digital we’re sssuper excited to announce that we’re bringing our upcoming title Snake Pass to PlayStation Experience with some exclusive serpentine action to share. Especially for PlayStation Experience, we’ll be showing the first global PS4 preview of our slithery “snake physics” puzzle platformer and unveiling one of our never-before-seen fire themed levels. Can you stand the heat as you guide our hero Noodle the snake through the fiery regions of Haven Tor? 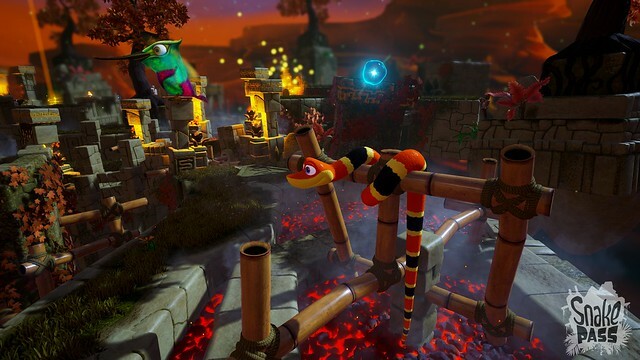 With bright and colorful platforming landscapes, Snake Pass is unique — you control Noodle as he slithers, curls, climbs, and coils his way around a series of increasingly challenging worlds filled with ever more intricate and fiendish obstacles. Born from the mind of former Little Big Planet community creator Seb Liese, Snake Pass is a game that players will find easy to pick up but incredibly difficult to master. With hours of fun to be had and a plethora of collectibles to find, it’s a game you have to experience to believe! But we’re not done yet! As a special treat for PlayStation Experience attendees, we’ll be hosting our incredibly popular speed-run competitions, giving you a chance to win one of our fang-tastic limited edition Snake Pass t-shirts and other snakey goodies! So, if you’re heading down to PlayStation Experience, stop by our booth, meet some of the team, and check out Snake Pass! From everyone here at Sumo Digital, we hope you love the game as much as we do and we can’t wait for all of you to come check it out for yourselves! Snake Pass will be heading to PS4 in early 2017.